Happy first Monday of 2017. I hope everyone had a wonderful weekend, and great time ringing in the new year. In case you missed it, I shared about my new years eve in a special post yesterday, along with a little recap of the past year (including my ten most popular looks), and message to my wonderful readers. Make sure to check the post out here. This year I'm starting off my looks with one of my favorite styles: off-the-shoulder. We all know how much I love off-the-shoulder tops, and having the style in a cozy knit means that I can bare my shoulders all winter long (as long as the temps don't get too cold)! I found this grey convertible neck sweater from Shein, and love that can be worn both off-the-shoulder or as a cowl neck, so basically you're getting two sweaters in one! I paired it with my favorite boyfriend jeans (which are currently on sale) and my blue velvet booties for an easy and cute winter outfit. I finished my look with my new Foley and Corinna Stevie Tote. It's the perfect size for lugging everything I need around during the day (wallet, lipstick, extra diapers, notebook), without being too big and overwhelming. 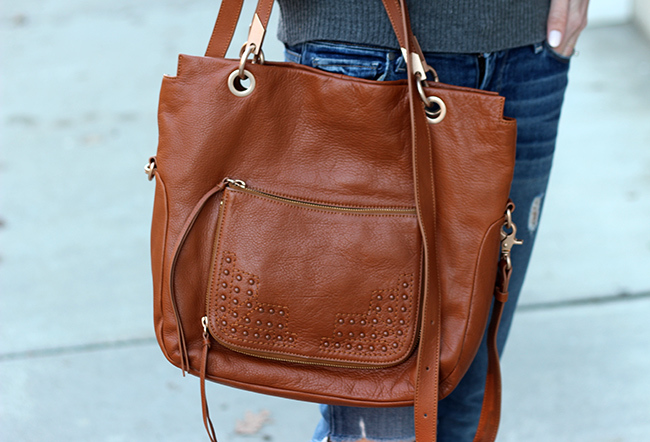 I love that is also comes with the longer strap so you're able to wear over your shoulder or as a cross body. I have always been a fan of Foley and Corinna bags for their design and quality, and know I'll be using this one on a daily basis. *Just a size note on this sweater, it only comes in one size. I do wish it fit a tad larger because I like my sweaters to be extra slouchy, but it's not going to stop me from wearing it all winter long. If your on the petite side, it would be a great pick, especially at under $25! What a great sweater! I love that it is convertible. Both ways look really good on you. I love that it can be worn multiple ways. I swear when I find a good sweater or tunic... I wear it alll the time! love the way you styled this! I love that you can wear the top two ways. So dope! I love the off the shoulder look, and at least when it gets cold you can still pull it up and enjoy wearing it. Happy New Year! I don't like this style of sweater. it should be changed. Love that the sweater is convertible! I feel bad buying OTS tops since I can't wear them to work, but one like this is so much more versatile! Love a versatile sweater like this, lady! So chic! I saw this look on insta and just love it! Those velvet booties are just fabulous! It makes going from work to a date night so incredibly easy! I need a sweater like this in my life! love the off-shoulder look on you and those jeans are perfect! I love how you can wear your sweater two ways! So versatile! I have such boot envy, they are so gorgeous! Love this sweater, looks so comfy and so versatile too! I love how versatile that sweater is! I'm obsessed with those boots too! This sweater is so cute! 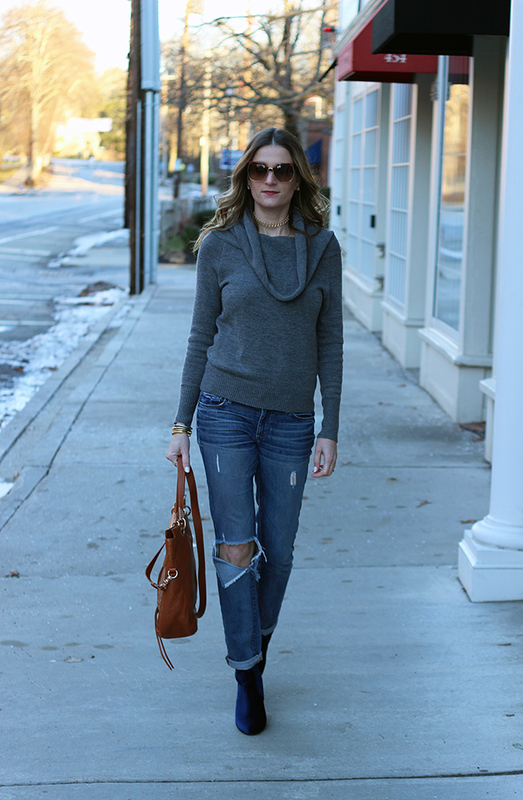 Love the versatility and I need those jeans!